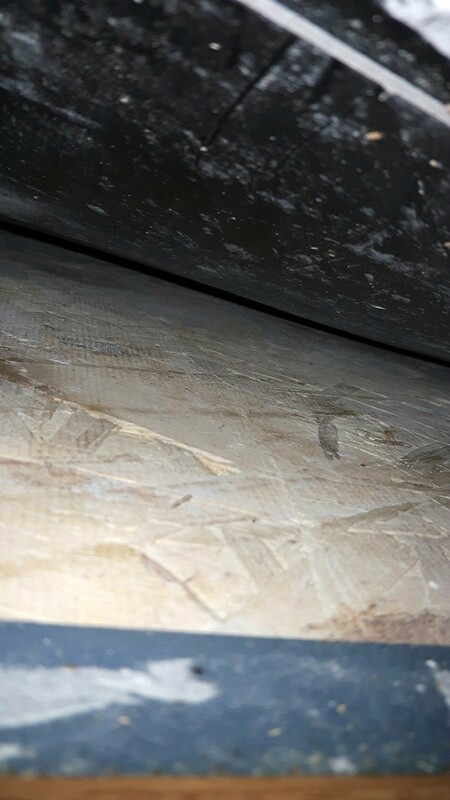 Establishing who is responsible for mold assessment and cleanup in a rental property can be frustrating. 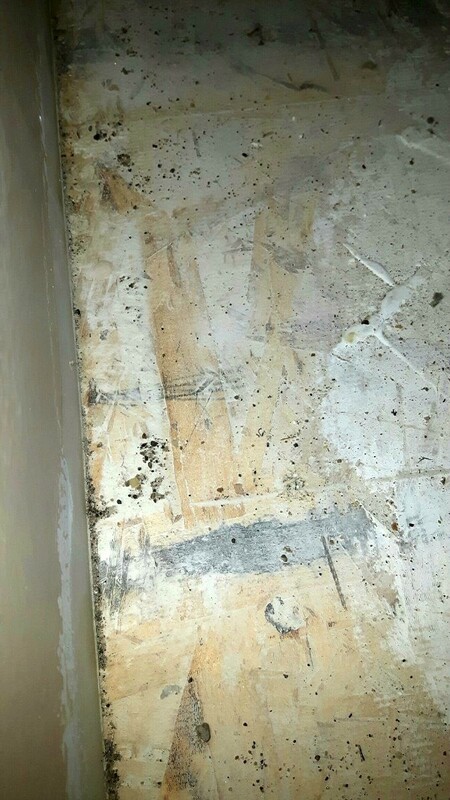 This is a guide about legal responsibility for mold in a rental house. I rent a cottage which is wet, cold, and damp. It has black and green mould growing everywhere, but mainly in the bedrooms where my children sleep. The landlord isn't really that bothered. Can someone advise me on the legal side please? Definitely take action. This mold can be very unhealthy for your family, especially the children . Call the courthouse, your DHS OFFICE or housing authorities. No one should be forced to live in these circumstances. There will be people who can help. Do not fear this landlord. He is greatly at fault. I live in Scotland and am married to a retired council officer (historic building conservation). He says he's not sure if you can take this to the Trading Commission but he strongly urges that you contact your local Legal Aid, your GP. Take photos and ask your doctor if the children's health is being compromised. Ask your MP for assistance in making your private landlord sort this right away. He feels you have a good case. Based on the photograph you posted here he feels there is a structural defect causing extreme damp and that there may be other defects (wiring) in conjunction with the damp besides the mould. Your family could be in danger of fire, for example, in addition to the health problems. The mould on the walls of your children's bedroom(s) should be carefully photographed to include a time and date stamp. Don't give up on this. Document everything you do. Meanwhile, after, you've photographed everything, use white distilled non-brewed vinegar, full strength, to kill the mould. 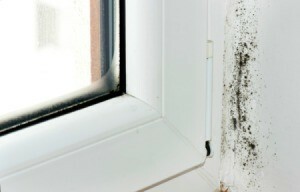 The mould will come back but it will help cut down some of the health problems. Good luck, this is really awful and I wish you all the best in getting this solved! Over the last few weeks, I have got really sick, and had to discard everything I own in my apartment. It's difficult to explain, and my land lord is denying any possible chance of mold. 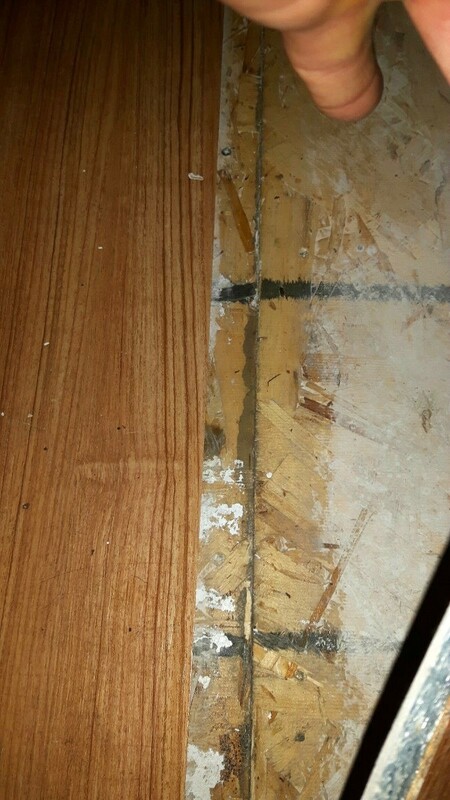 Could someone please clarify if what I found under my, what appears to be rubberized laminate flooring, to be a mold of some sort. It's been a very exhausting few weeks and I just need to know before I fork out another couple hundred to get a mold detection specialist in here. 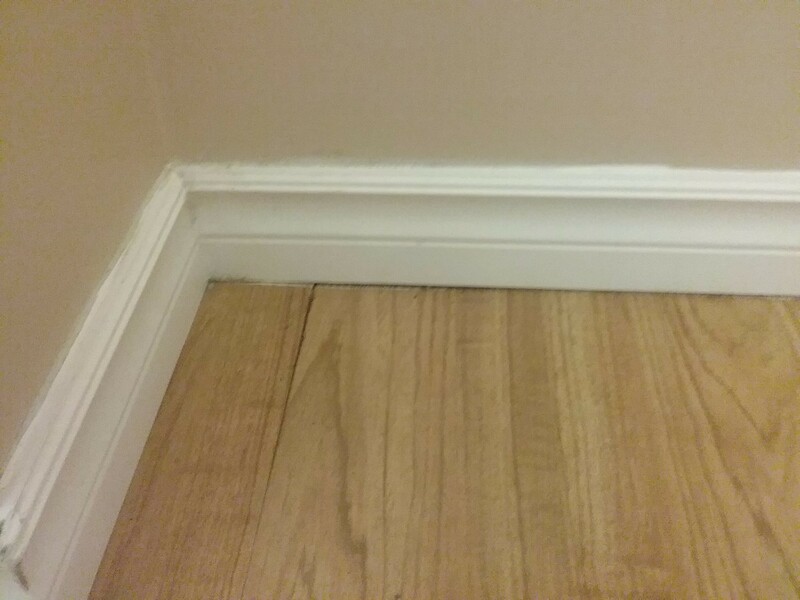 The white stuff under my flooring looks like paint, but it rubs off, plus I'm not sure what happens to black mold when it dries up, I've read it turns to a powdery substance. 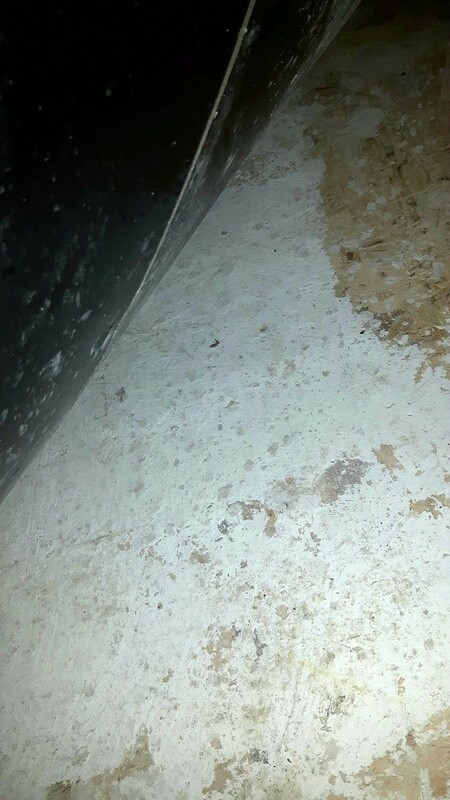 The last pics shows some dark stuff coming up through the flooring. Can anybody help? 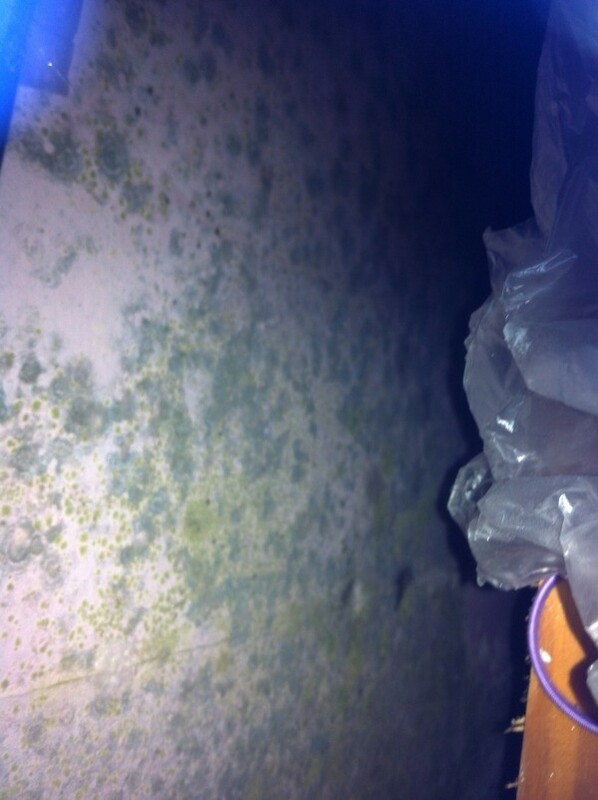 This is mold. You can destroy it with a bleach solution. However, a rental agreement is to provide you with a safe place to live in exchange for rent. He is not keeping his part of the bargain. You can take him to court. You can also notify the Department of Health. Years ago we had a landlord who didn't give sufficient heat. We had the Department of Health come and take the temperature of the apartment. Once we had proof that we were right, we stopped paying rent until he fixed the issue. We moved out once we found a better place to live. IT definitely is mold, from the looks of it. Plus your sickness is also evidence, and the fact you had to throw out your things. You could sue for damages, upon having to do all these things because of the landlord's negligence. It does appear to be mold. Have the landlord come back over and look at it. Thank you so much, I must tell you all that I live in Ontario Canada, and I'm not to sure I can sue, if I could, is it really worth it.